Every block in this book is easily made using Perfect Patchwork Templates Sets A and C, and Sets B and D from Marti Michell. 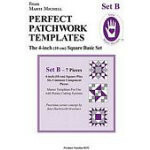 Combine strip techniques with Perfect Patchwork Templates and cut by the numbers! From Marti Michell. 48 pages.